Personal loans can be great or they can be dangerous. If abused, you can end up with unnecessary bills that you can’t afford. 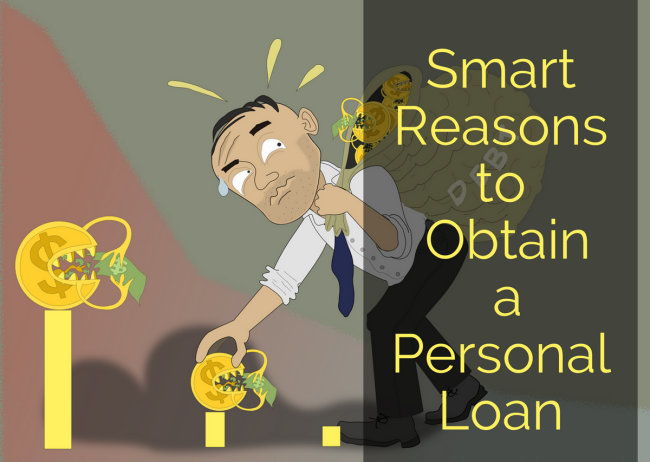 However, if you’re smart and only get personal loans when they’re extremely beneficial, they can be helpful. Here are some great reasons to get a personal loan. If you don’t have much credit history, you need to work on building it. Personal loans are a great way to do this. You don’t need to take out a large loan. You just need to take out something. Make sure you understand how much you are paying back, so you can ensure that you’ll be able to afford your payments. If you make any late payments, your loan will be counter-productive. You don’t want to pay the whole loan back right away. Making a lump payment to pay back your loan won’t raise your credit much. Make minimum payments every month, or make a few dollars over the minimum payment to keep the interest down a little. Every time you make a payment, your credit will improve slightly. Only take out one loan at a time, because your debt to income ratio is lowered every time you take out a loan. Business loans can be difficult to get when you’re starting a small home business. Most require a detailed business plan, the business to be registered, and many other stipulations. With a personal loan, you can avoid all of the hassles. If you’re refurbishing broken computers for resale, selling crafts out of your home, or something else that doesn’t require a huge startup cost or employees, it seems unnecessary to go through all of that. You can apply for a personal loan to buy what you need to begin, and then buy more stuff with revenue from sales. Starting a home business with your own income can be difficult. This will allow you to start immediately and not worry about putting yourself in a financial bind while you’re waiting to make a sale. Making payments on past due bills is exhausting when you’re trying to pay a dozen different bills at once. It causes you to forget certain bills from time to time. You might end up putting some of the bills off, and you could wind up with astronomical late charges and finance fees. Consolidating your bills allow you to make one payment each month, giving you a lower interest rate in the long run. Using personal loans to shorten the time it takes to pay back a loan allows you to pay much less in extra charges and fees. To do this, Add up the bills you are paying and get a personal loan that will cover all of your bills. Use the loan to pay off your bills all at once, and then you can just pay the loan back over time. It will lower your stress and it could save you money. Plus, many companies will give you a lower payoff than you even owe if you’re paying it off in a lump sum. Buying a new car is always nice, but they depreciate so quickly, it’s not always worth it. A new car depreciates the second you drive off the lot. In fact, in that one second, it will depreciate about 9 to 11%. At the end of the first year, your vehicle will depreciate another 10%. It will continue to depreciate 10 to 11% for the next four years after that. Therefore, buying a vehicle that’s only a couple years old will give you a better bang for your buck. You can buy a car just as nice with low miles and be able to afford it by taking out a personal loan. Instead of spending 5 to 6 years making high payments on a new vehicle, you can make lower payments for 3 or 4 years. Buying stocks and investing in IRAs is a great way to invest in your future. Unfortunately, many people don’t have the disposable income to do those kinds of things out of their paychecks. If you want to make some investments, using a personal loan is a great idea. Make sure you use a financial advisor and find the best way to invest it. You don’t want to waste your loan with bad investments. By the time you see a return on your investment, your loan will be paid back and you can enjoy the fruits of your good decision. Personal loans aren’t a good idea if you want to go splurge on some unnecessary electronics, but if it’s used to improve your life, it couldn’t hurt. Make sure you don’t go in over your head and only take out loans that you can afford to pay back.